Freediving has really been taking off around the world in the past year or so. The reason is simple, freedivers, experts and learners alike, realise how accessible it really is. 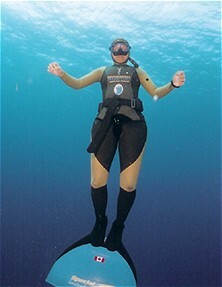 Dive safely to 20, 30 meters or more on a single breath of air. Stay underwater for minutes at a time. Freediving is a beautiful meditative sport to safely push your limits, and understand your body and mind. Freediving is a sport with a long traditional history, and an exciting cutting-edge present. Advances in training and techniques over the past several years have led to new records being set regularly. World-class freedivers now routinely exceed depths and breath-hold times that, just a decade ago, medical professionals had assumed to be the human maximum. Learn some of these techniques to enhance your breath hold time and depth, and keep you safe while you're in the water. Ideal for your next snorkeling or spearfishing adventure, or for a no-tanks session on a scuba trip. Freediving training also makes you less of a gas-guzzler in scuba, prolonging your dive-time. * Dynamic: Form and technique in swimming for distance on a single breath. Whether you're already an accomplished freediver or you'd like to learn how to be thrilled by all that life below the water surface on one lung-full of air, get in touch with us. We'll have you holding your breath in our crystal-clear water before you know it.